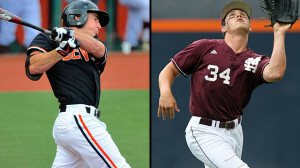 Oregon State and Mississippi State are two of four teams remaining in the 2013 College World Series. Oregon State needs to win today and then again tomorrow to advance to the finals. Mississippi State will send Kendall Graven (7-5, 3.17 ERA, 67 strikeouts) to the mound, and Oregon State will send right-hander Andrew Moore (14-1, 1.57 ERA, 72 strikeouts). Mississippi State has posted three straight one run win’s in the tournament and have shown an ability to hit in the clutch in the late innings. The Bulldogs are led by SS Adam Frazier (.360, 20 2Bs, 7 3Bs, 38 RBIs, .476 slugging percentage); RF Hunter Renfroe (.357, 16 2Bs, 15 HRs, 62 RBIs, .631 slugging percentage); 3B Alex Detz (.317, 1 HR, 31 RBIs, 53 BBs, .454 on-base percentage). In the bullpen relievers Ross Mitchell and Chad Girodo have been outstanding combining to pitch 35-2⁄3 innings, allow just five earned runs (1.26 ERA) and claim five of Mississippi State’s seven wins. Girodo has struck out 34 hitters in 19-1⁄3 innings, while Mitchell has yet to allow an earned run and is limiting opponents to a .220 batting average. Oregon State lost to Mississippi State in the opener 5-4 but the Beavers have come back with elimination game victories over Louisville and Indiana. Oregon State has somehow kept winning despite getting minimal hit production from Dylan Davis and Danny Hayes, who bat fourth and fifth in the lineup. Davis is hitting .091 in the CWS and .263 in nine NCAA tournament games, while Hayes has a .182 average in Omaha. Led by LF Michael Conforto (.333, 14 2Bs, 11 HRs, 47 RBIs, .535 slugging percentage, 41 BBs); RF Dylan Davis (.332, 22 2Bs, 5 HRs, 61 RBIs, .502 slugging percentage); 2B Andy Peterson (.331, 5 2Bs, 27 RBIs, 13 SBs) and more will need to pitch a little better than he did in the first outing when he gave up six hits and four runs over 7 1/3 innings.